We moved to September Cottage in 2005 and inherited a relatively simple garden consisting of a lawn and a large rockery filled with shrubs and herbaceous perennials. There was also a lovely rose-covered arbour and two fruit trees. However, we had always been vegetable growers and we soon dug a vegetable patch at the bottom of the garden and erected a greenhouse. We subsequently added two apple trees and some soft fruit bushes. The rockery contains weigela, deutzia, pieris, hypericum, heathers, roses, fuschia, honeysuckle and pampas grass. There are also day-lillies, crocosmia, red-hot pokers, cornflower, michaelmas daisies, lillies of the valley, peonies and geraniums. A path runs around the back of the rockery. In 2010 we moved, temporarily, into Brecon House, in the close, where we created a larger vegetable garden. 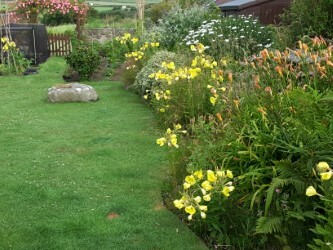 The garden at September Cottage was rather neglected apart from regular lawn-mowing and hedge-cutting. When we moved back in 2013, we re-established the veg. patch and put up another, larger greenhouse. Then three years ago, we were fortunate in being able to purchase an extra piece of land beyond the bottom of our garden. 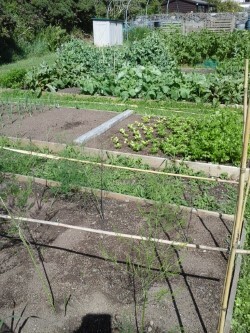 This would enable us to grow more veg, so we set about planning. The first job was to gain access. The old arbour had deteriorated so badly that it no longer supported the roses. This was the perfect place to cut through the wall, put in a gate and build a new arch for the roses to scramble over. In this new area we have created eight vegetable beds and planted apple, pear, plum and greengage trees. There is a fruit cage containing redcurrants, gooseberries, blueberries and strawberries. Along one boundary, we have planted an ‘edible’ hedge which includes sea-buckthorn, blackthorn, hawthorn, rowan, dog rose, crab apple and cherry plum. A second boundary hedge is still in its ‘natural’ state with bramble, gorse and elder growing on the old field-boundary wall. We have tried to establish a wild flower area and, hopefully, we shall have a repeat of last year’s display of field-poppies, ox-eye daisies, cornflowers, lunaria (honesty) and calendula. This area is bordered by multi-coloured wallflowers in the Spring and this year, we have completed a wildlife pond and an area for alpine plants. 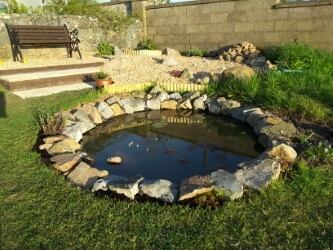 The next project is to make a bog garden near the pond. The two greenhouses and the vegetable beds keep us self-sufficient in fruit and veg throughout the year. Any surplus is made into jams, chutneys, pickles, soups, sauces and beverages. We try to grow as organically as we can, collecting rainwater in twelve water butts and turning everything possible into compost, via six compost bins. We encourage wildlife, especially pollinators, in various ways and always let the last of the brassicas run to flower so that the bees have an early source of pollen. There are several buddleia and sedum around the garden which, of course, the butterflies love and a large spread of passion flower which, along with the nearby hypericum, becomes alive with the loud buzz of several varieties of bees. We always let annual and biennial flowers such as evening primrose, foxglove, aquilegia, poppy and viola, seed themselves over the entire garden (including among the vegetables), removing only those which are really in the way! Birds are not encouraged by feeding (we have a cat!) but they still come to feed on the aphids, snails and worms and also on the seed heads of dandelions, evening primrose and other annual plants. September Cottage does not have a neat, manicured garden full of beautiful specimen flowers. It’s a practical, working garden designed to feed us and give us a tranquil space to work and, occasionally, relax. Weeding is a chore which often doesn’t get done but Francis makes a wonderful job of mowing and edging the lawns. The ground is slightly uneven and there are steps here and there. There are several places around the garden where you can sit and admire the views across the valley to Clegyr Boia and up the coast to Carn Llidi.